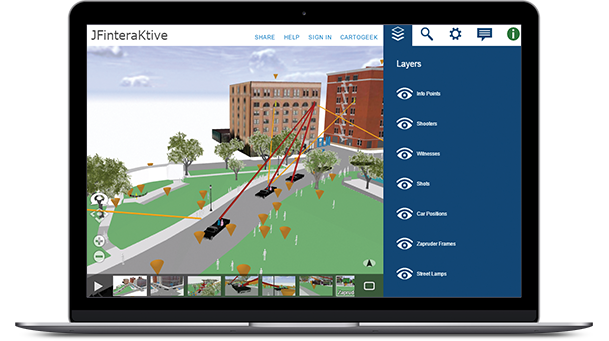 3D content can be displayed within two different scene environments—a global world and a local (or plane) world. Global views are currently the more prevalent view type, where 3D content is displayed in a global coordinate system shown in the form of a sphere. 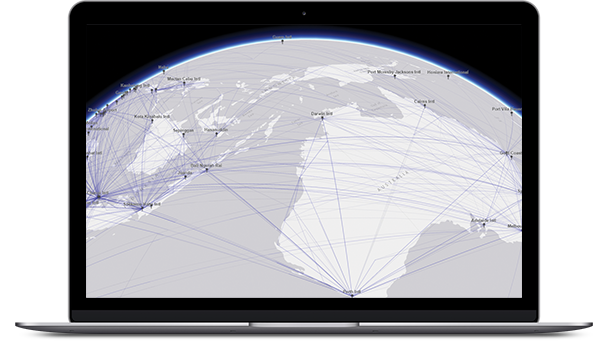 A global canvas is well suited for data that extends across large distances and where curvature of the earth must be accounted for, like global airline traffic paths or shipping lanes. In this local scene, Dealey Plaza in Dallas serves as the backdrop for a 3D recreation of the events that shocked the world on November 22, 1963. Local views are like self-contained fishtanks, where scenes have a fixed extent in which you work. They are better suited for small-extent data, such as a college campus or a mine site, and bring the additional benefit of supporting display in projected coordinate systems. Local views can also be very effective for scientific data display, where the relative size of features is a more important display requirement than the physical location of the content on a spheroid. A surface is like a piece of skin pulled tight against the earth. Surface data by definition includes an x, y, and z value for any point on it. A surface can be a physical thing that exists in the real world, like a mountain range, or it can be an imagined surface that might exist in the future, such as a road grading plan. It can even show a theme that only exists conceptually, such as a population density surface. Surfaces come in a wide variety of accuracies, with anything from high-resolution, 1-inch accuracy all the way down to a low-resolution surface with 90 meters or coarser accuracy. 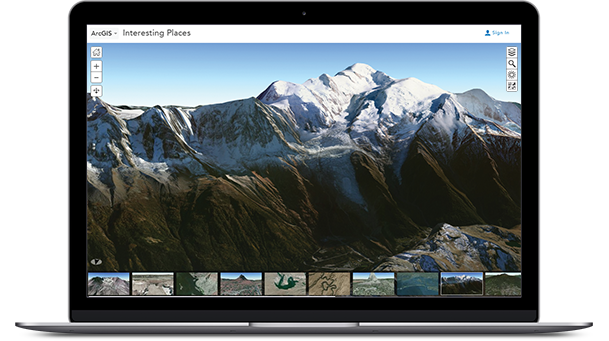 This scene presents surfaces of interesting places on our planet, featuring the World Imagery basemap along with Terrain 3D layers. You can click on the slides in the scene to explore them and navigate the scene to see different perspectives for each place. Surfaces are fundamental building blocks for nearly every scene you will create because they provide a foundation upon which other content can be draped. Sometimes the surface itself is the star of the show (like a scene of Mt. Everest). Other times the surface serves a more humble role of accommodating other crucial scene data, such as aerial imagery or administrative boundaries. And surfaces can also provide base-height information for 3D vector symbols, like trees, buildings, and fire hydrants, that might otherwise not “know” their vertical position within the scene. Symbolizing features using a real-world size is extremely common in 3D. For example, it’s expected that buildings, trees, and light poles would all be displayed at the same relative size in the virtual world as they exist in reality. Even some thematic symbols, like a sphere showing the estimated illumination distance of one of the light poles, will help communicate the notion of a real-world size. 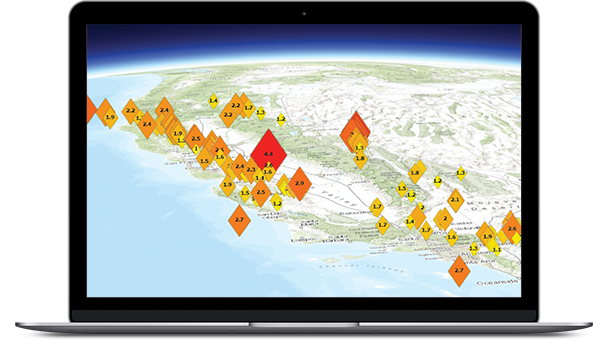 This earthquake map of Southern California features screen-size symbols that remain the same size regardless of how far or where you zoom in and out. However, it is also useful to have symbols in the scene that use an on-screen size instead. That is, as you zoom in and out within the view, the symbol always displays with the same number of pixels on the screen. This effect is analogous to a 2D map layer whose symbol sizes do not change as you move between map scales.